What many of us deem to be superfoods are simply foods that are exceptionally rich in particular nutrients, often times at a much higher rate than what is regarded as the norm. These days, superfoods tend to be characterized as specialty items. Although, wild blueberries, broccoli sprouts, kale, and many other commonly found foods are also quite nutrient dense and high in antioxidants, and can easily be considered a ‘superfood’. That said, following are a few of my favorite intensely nutrient items that I incorporate on most days, depending on what I feel my body is needing, including helpful information for each. Pictured below are hemp seeds, maca powder, goji berries, and chia seeds. Hemp seeds have a pleasant nutty flavor and supply Omega 3 as well as Omega 6 Essential Fatty Acids, all ten essential amino acids, and a healthy dose of protein. They can be added to smoothies, soups, salads, whole food meal bars, breakfast porridge and desserts. I often enjoy chopped mixed fruit sprinkled with hemp seeds. They are also really delicious as an added topping for pasta. Maca powder is produced from a root vegetable native to Peru and is a member of the radish family. It has a slightly sweet, malty flavor that pairs exceptionally well with chocolate—among other things! Maca is an adaptogen, a hormone balancer, and an excellent source of minerals, B vitamins and protein. I love adding maca to various blended concoctions and savory dishes. I even include it as an ingredient for creating various types of condiments. Goji berries have more vitamin C than oranges, more beta-carotene than carrots, important trace minerals including selenium, iron, copper and zinc, and contain eighteen different amino acids. Their flavor is a cross between dried cranberries and raisins, and they are not overly sweet. While goji berries are wonderful to snack on straight, they are great for adding to smoothies, fashioned into a medicinal tea, and sprinkled into salads, fruit mixes, trail mixes, soups, cereals, etc. I often use goji berries in place of raisins with much success. Chia seeds are rich in protein, calcium, iron and fiber as well as Omega 3 Essential Fatty Acids. They are ever-so-slightly reminiscent of flax seeds though taste creamier and sweeter and also a tad nutty. They absorb at least nine times their volume in liquid and are wonderfully hydrating, and are especially great for helping to increase athletic endurance. Plus, they keep you sated and energized. I love using chia seeds to enrich and thicken smoothies. In addition, they are excellent for making various types of dressings, puddings, cereals, sprinkled on top of salads, as an ingredient in crackers or breads and more. I often chose heirloom white chia seeds for their milder flavor. However, if you are unable to obtain that variety of chia, you can opt for more readily available heirloom black chia seeds without worry. Over the many years that I have incorporated superfoods into my eating regimen, I can comfortably say they have positively enhanced my overall well-being and will remain an integral part of my daily habits. The four superfoods mentioned above can easily be included and help boost immunity by providing extra amounts of vitamins, minerals, essential amino acids, and essential fatty acids. Green leafy vegetables are important in any diet, especially a raw food diet. They supply the body with the building blocks of protein via an abundance of amino acids, are a rich source of chlorophyll, essential vitamins and minerals as well as much needed fiber, and also boost detoxification and alkalinity. There are as many types of leafy greens as there are ways to incorporate them. Your palate will be a major determining factor of what sorts of greens you will prefer. It is imperative to remember that over time your palate will shift as you eat more natural foods and less processed items. So if at first you do not find much enjoyment in a particular vegetable, you may relish it later on as your sense of taste changes and adapts. A helpful tip: Increasing the amount of green leafy vegetables in your diet can greatly help stave off cravings as the body works to become cleaner. Various nutrients provided by leafy greens are very beneficial during detoxification and also to one’s overall well-being. 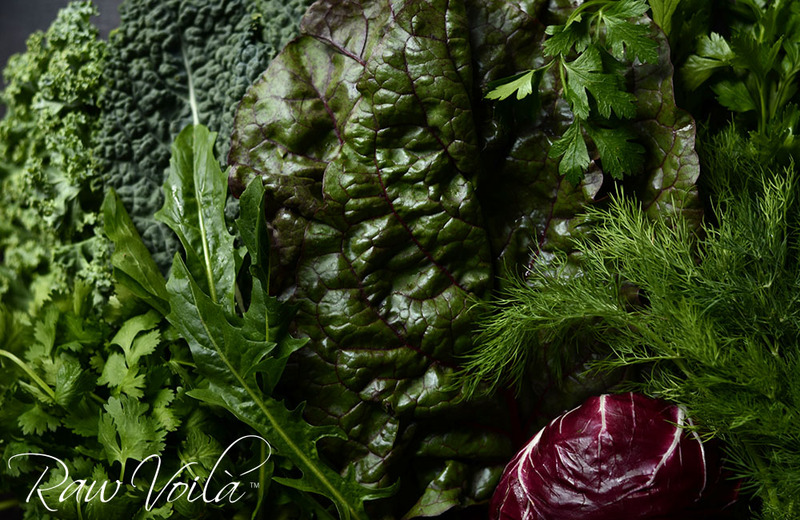 Typically, green leafy vegetables literally are green, though some can be found in varying shades of purple or red and are considered to be a leafy green. In general, the darker the hue the more intense the vitamin and mineral content, so indulge more often in whatever deeply-hued vegetables you prefer. As earlier mentioned, there are many types of leafy items to choose from, availability dependent upon the growing season. The following is a list of just some of them. Kale (Lacinato, Red Russian, purple, curly green), spinach, chard (red, green and rainbow), red leaf lettuce, green leaf lettuce, romaine lettuce (red and green), Boston lettuce (also known as Butter lettuce, red and green), celery greens, beet greens, radicchio, endive, frisée, escarole, dandelion greens, Mizuna greens, arugula, watercress, collard greens, bok choy (adult and baby bok choy, green and purple) and cabbage (red and green). Green leafy vegetables can be easily incorporated into any diet simply by way of salads, soups, smoothies, juices, wraps, and even transformed into chips. In addition, green leafy herbs such as parsley, cilantro, mint and others are also wonderful to include as they have many healing properties and essential vitamins and minerals. Cilantro helps to remove heavy metals from the body while parsley is a powerful anti-carcinogen and great for cardiovascular health. And mint is excellent for the digestion. The brassica family is a powerful one, magical even! Its members are some of the most potent protectors from common degenerative diseases. In addition to cabbage and kale, also included are brussels sprouts, broccoli, cauliflower and kohlrabi, among others—each versatile and delicious. There are countless ways to enjoy cabbage and kale, and I often indulge in both of them. Abracabrassica is an interesting twist on a basic green mix. It can certainly be enjoyed as is, although tasty as well when eaten alongside a creamy avocado for added dimension. And if it is allowed to marinate for a longer period of time, to soften more and intensify in flavor, it can be creatively included as an ingredient inside of a wrap or as a sandwich topping. Green cabbage and kale are great sources of vitamins K and C, kale in particular also being a good source of iron. Both cabbage and kale are exceptional for detoxifying the liver. Cilantro is excellent for aiding the body in removing heavy metals. It wonderfully pairs with the lime and ginger, and lends a lovely high flavor note to the mix. If you adore cilantro as I do, use the whole leaves instead of coarsely chopped leaves for more taste explosion in each bite. Goji berries are exceptionally high in vitamin C and contain important trace minerals including selenium, iron, copper and zinc. Their flavor is a cross between dried cranberries and raisins, their somewhat mild sweetness a nice complement to the tartness of the Granny Smith apple, and their flavor a nice combination with the orange blossom essence in the vinaigrette. The unaltered zing of the Granny Smith apple adds brightness and plays well with the marinated components. The vinaigrette is punchy though lightweight with a subtle underlying sweetness, and very versatile beyond this recipe. It can be further altered with fresh herbs and various spices, wherever your imagination leads you. Enjoy! A beautifully simple, flavorful and naturally detoxifying mix. Place into a medium bowl and toss together the cabbage, kale and goji berries with two tablespoons of ‘Sesame Balsamic Vinaigrette’ (recipe below). Allow them to marinate for 15 minutes, periodically tossing again to ensure that they remain completely coated with the vinaigrette. As they marinate, the cabbage and kale will soften and the goji berries will plump up slightly. Once the cabbage, kale and goji berries have been marinated, then add the apple and cilantro, gently toss and serve. Abracabrassica is best enjoyed immediately. Place into a small bowl and whisk together all of the ingredients until emulsified. Store any leftover vinaigrette in an airtight container inside of the refrigerator and use within 3 to 5 days. The listed ingredients roughly amount to one comfortable serving, or two small servings. Double or triple the recipe as needed. Abracabrassica is meant to be enjoyed while fresh tasting and still moderately crisp, hence the short marination of 15 minutes. However, as mentioned above, it can also be eaten after longer marination. Keep in mind the longer the components marinate, the more intensified their flavors. Intended use and personal preference will help to determine the best process. In the above ingredients, I noted 1 cup green cabbage leaves, stemmed, cut into a thin chiffonade and firmly packed and 1/3 cup Lacinato kale, stemmed and deveined, cut into a thin chiffonade and firmly packed. The thinner the slices the easier on the palate, especially for those who are not yet won over by the often seemingly potent flavors of green leafy vegetables. I also prefer to remove the veins and hard stems to keep the overall texture light and increase the likelihood of a pleasant and welcoming mouthfeel. Plus, I just love the technique and presentation, and use it often. If you create thicker slices and/or leave intact the veins and stems, the overall flavor and texture will be in some measure different, though not horribly. The mix may also require longer marination due to the increased thickness. In the above ingredients, I noted 1/2 cup Granny Smith apple, julienned on a mandoline (skin left on). If you do not have a mandoline, you can create thin matchstick-like slices by hand using a sharp knife. First create apple slices 1/8-inch thick. Then layer together the apple slices and slice them into 1/8-inch thick sticks. A hand-held julienne peeler can also be utilized.